Clean, creamy and reliable. 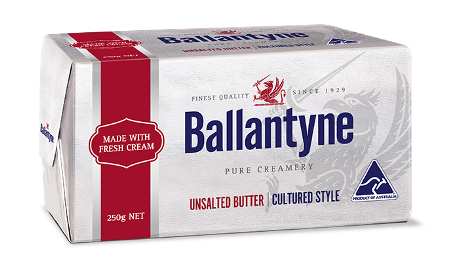 Ballantyne Cultured Unsalted is the chef’s choice for cooking and baking. Produced in the traditional manner, using fermented cream to give the product its full-bodied taste. Its low moisture content makes it equally perfect for those springy lamingtons or your signature anzac biscuits. As this butter contains no salt, you are completely in control of the taste. When you want your cooking to really shine this is the butter for you.